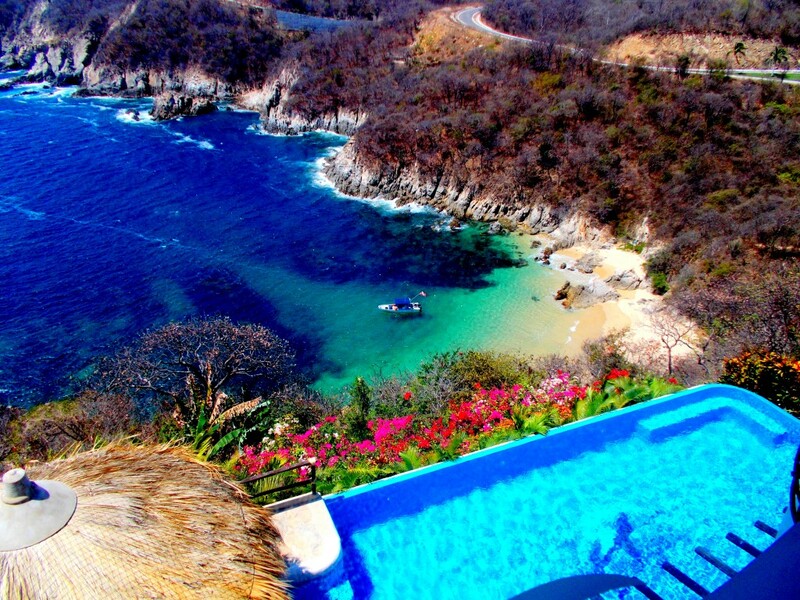 Santorini, Greece – Interlaken and Lucerne, Switzerland – Positano, Italy – The Himalayas – these are a few of the destinations that make my short list of “no matter how you imagined it, it’s better.” After my recent trip to Oaxaca for my 50th birthday, it’s time to add a couple more to the list: Huatulco and the ocean front villas and casitas at Las Palmas. 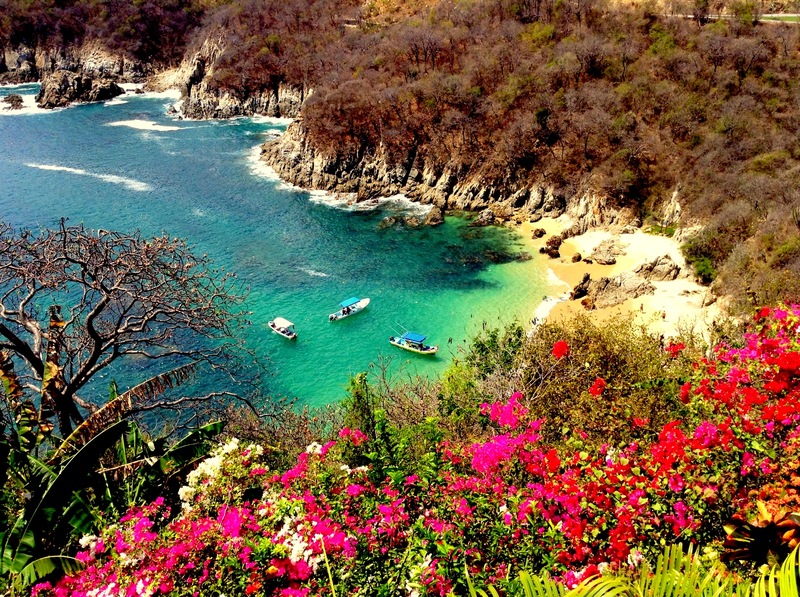 As a writer, I have the rare opportunity to travel through Mexico in search of paradise. 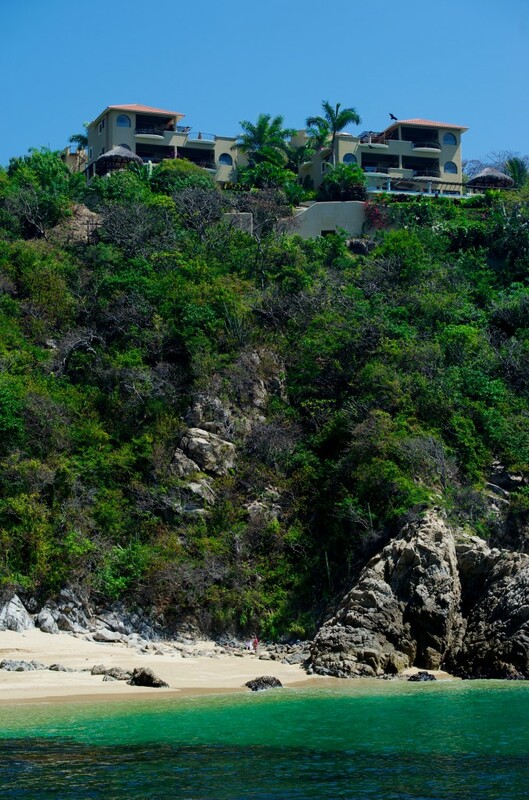 I have found hundreds of amazing destinations throughout this marvelous country, but from the heart, I can tell you Huatulco is simply one of the best beach resorts in the entire country, and Las Palmas one of most perfect places where I’ve had a chance to stay… and that’s a tall order. 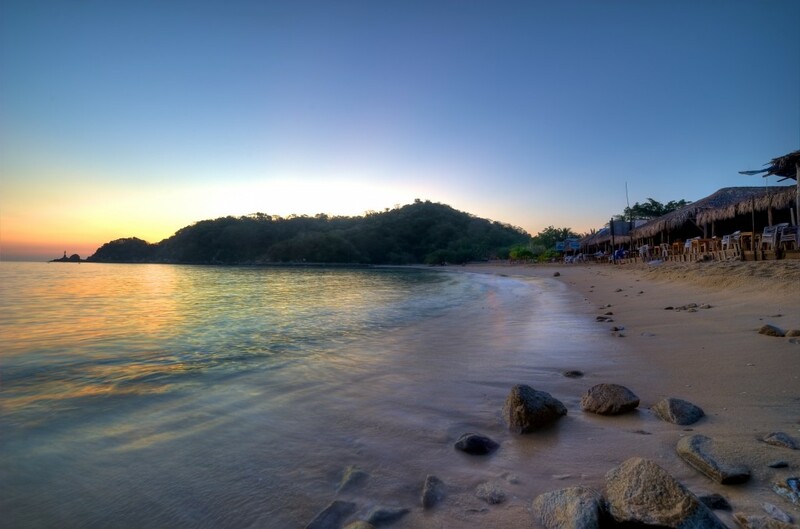 There is a certain inexplicable magic here, a laid back sweetness if you will, all wrapped in the inviting smiles of the local people who are always happy you chose their charming, yet isolated, gem of a beach town on the Pacific. In the early 1970’s, the Mexican government embarked on an ambitious plan to develop tourism through a series of integrated master-planned beach resorts. FONATUR, which is the National Trust for Tourism Development (Fondo Nacional del Fomento al Turismo), was responsible for the blockbuster resorts of Cancun, Ixtapa and Los Cabos, as well as the lesser-known communities of Loreto and the Bahías de Huatulco (the Bays of Huatulco, which has been shortened to simply “Huatulco.”) Nonetheless, their loss is your gain. The very fact that it hasn’t exploded with tourism is exactly what makes it so very special. 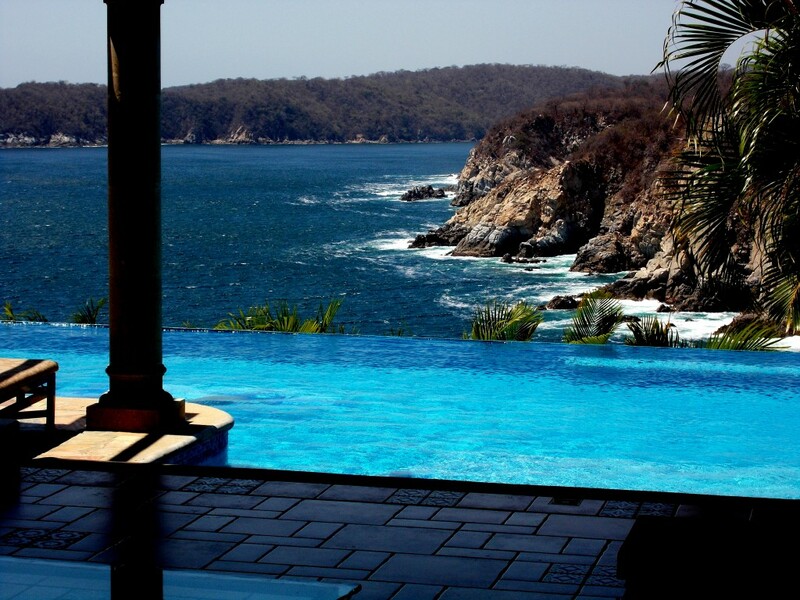 Huatulco is far different from its high profile companions. 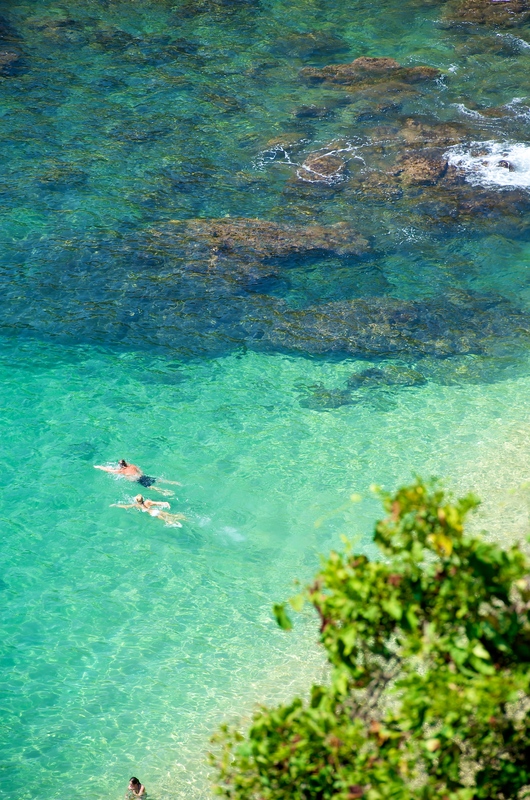 Considered and developed as an “ecotourism” resort, 70% of Huatulco is made up of ecological preserves. 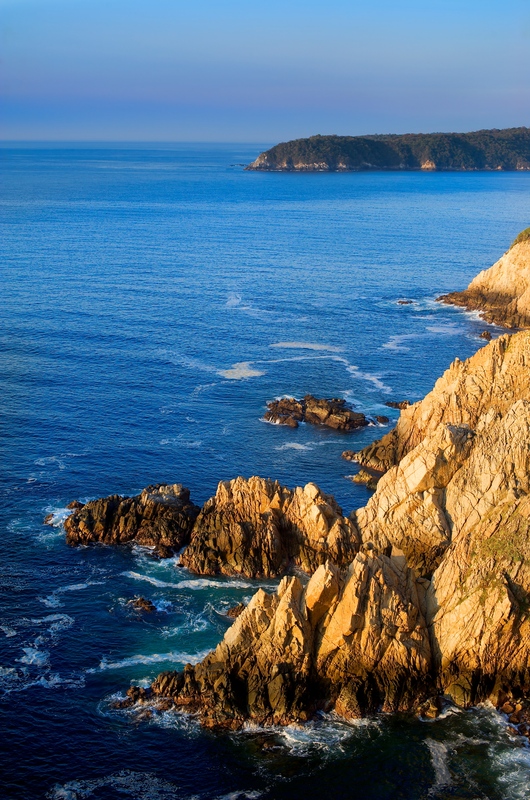 In 1988, then President Ernesto Zedillo converted most of Huatulco’s preserves into a giant national park (protecting both land and marine life). They pride themselves in being a totally “green” resort. 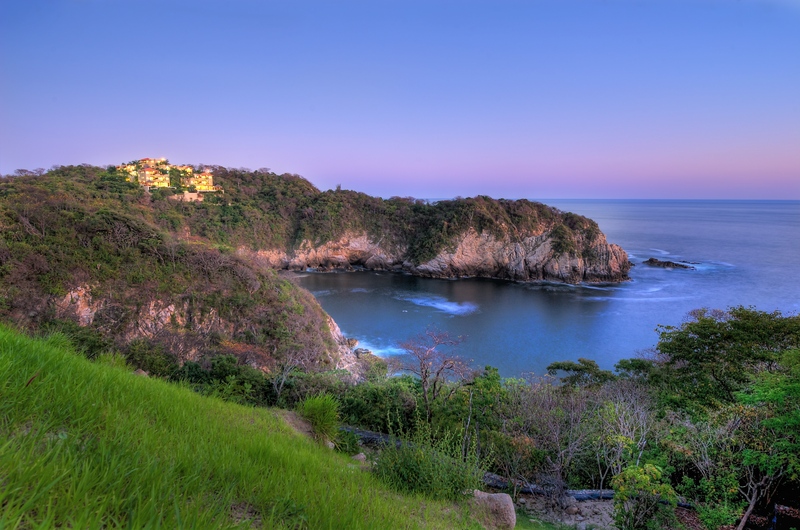 FONATUR still controls all local land sales within the development and ensures that all new projects meet certain standards in order to maintain Huatulco’s Green Globe status. At the center of it all are a series of nine spectacular bays notched into 21 miles of shoreline hosting 36 beaches, countless inlets and coves, and arguably some of the most extraordinary coastline on the Pacific. The crystal clear water, and usually sparsely populated golden sand beaches, somehow don’t feel like a tourist destination. It all seems a bit more secluded and private. And since some of the bays and beaches are only accessible by boat, everything remains as nature intended. I wouldn’t usually recommend much snorkeling on some parts of the Pacific coast, but rest assured you won’t be disappointed here. In my opinion, there just aren’t a lot of places like this left in the world. There is just enough development here to give you anything and everything you want in a beach resort, and just enough off-the-beaten-path remoteness to keep it off most tourists’ radar. Of the nine bays that were slated for development, only six have “visitor facilities.” The main areas are: Tangolunda Bay, home to the big resorts, an 18-hole golf course, a smattering of nightlife and a little resort shopping. The bay of Santa Cruz, with a good-sized marina, an intimate little village with beachside restaurants and bars, plenty of shops and an often-deserted cruise ship dock. And, Chahue Bay (CHAH-way), located between the two above, sports another marina, lots of new high-end condo projects and a public beach. About a mile inland, the charming little town of La Crucecita is a slice of pure Mexico. With a colorful and quaint town square, plenty of inviting restaurants and bars, a few excellent fresh seafood stalls to pick up the daily catch, and a very well-stocked grocery store (the Súper Che) that takes U.S. dollars and gives change in pesos at a great rate… what more do you need? 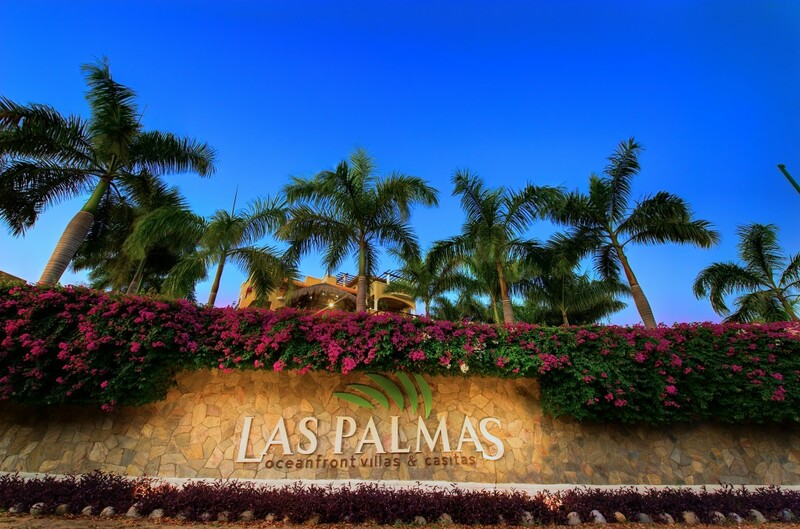 Well, you need an amazing place to stay… and that’s the subtle, refined, and perfectly done Las Palmas. 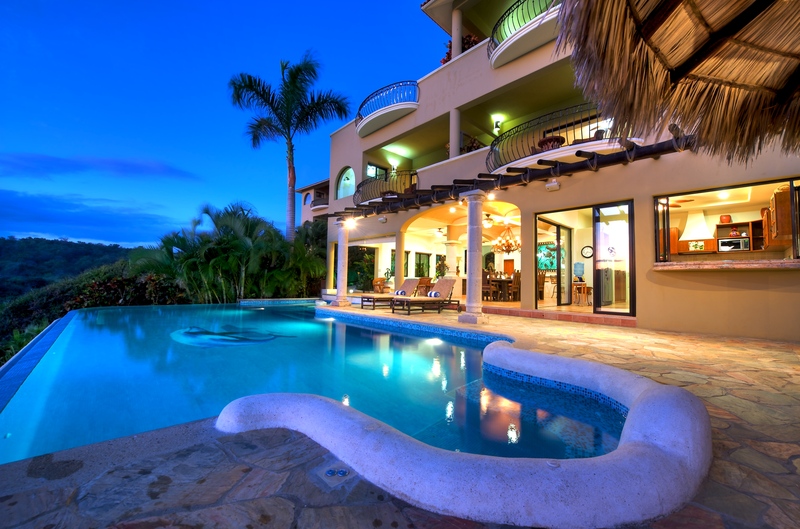 Since we were looking for a villa, my good friend Sylvie Laitre, who owns and operates Mexico Boutique Hotels, made the recommendation. A quick glance at the endless 5-star reviews on Trip Advisor and it was an easy sell. I was put in contact with the darling and incredibly efficient manager, Courtney Glassman. Her title, Director of Escapes, is very appropriate. She is the ideal hostess and makes sure everything is in perfect order before you arrive. Over the course of the next several months and years, the vision of Las Palmas began to develop. There was infrastructure in place with fresh water and electricity available at the street. 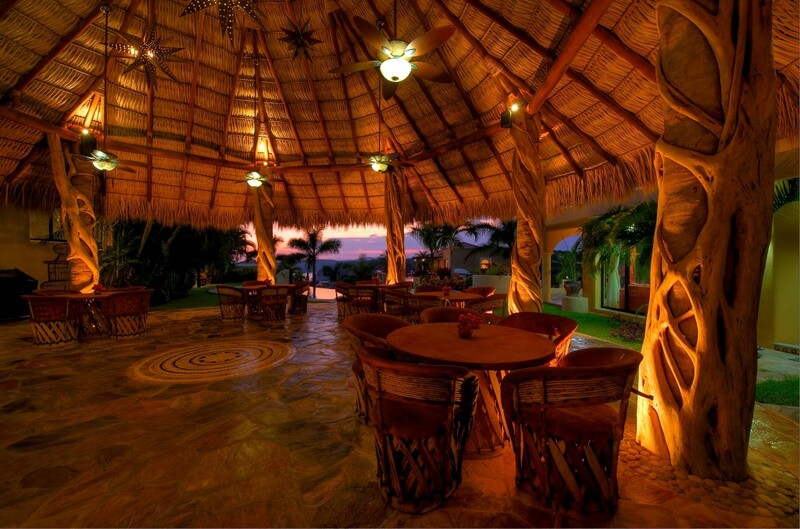 They interviewed three different architects and finally decided on Gontran Orozco Canales, who Ron and Jackie affectionately call the “contractor from heaven.” The doors opened to the Turtle Bay and Dolphin Cove Villas in 2007, the casitas followed in 2008 and the House of the Rising Sun villa in 2009. And since the beginning, it’s been all about the guests. “We have so many repeat guests that are like family to us now,” Jackie says. “The same five couples come every year and we arrange our big bookings (which are weddings) around our regulars,” Ron boasts with a smile. “It’s just soulful here and we do our best to make it unforgettable for everyone.” From where I sit, I’d say they have certainly succeeded in doing just that. Even though there were only four of us, we went all out and opted for the Dolphin Cove Villa. As many times as I looked at the pictures on their website in the months before we left, it was even more breathtaking when we arrived. We kept staring at each other in disbelief. 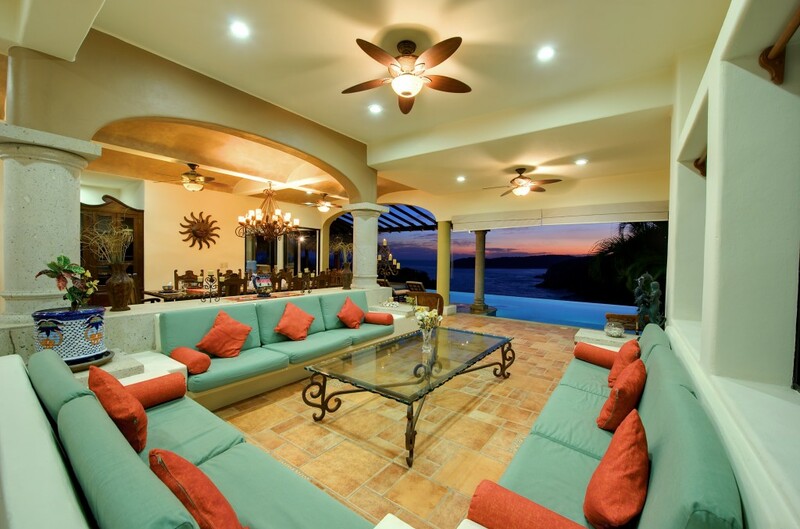 The open-air dining room and living room flowed seamlessly to the negative edge pool that seemed to connect to the Pacific horizon. The view… well, check out some of the photos and I think you’ll agree it’s quite breathtaking. Our concierge, Talina, was waiting for us at the villa to offer her services for anything we might need – excursions, private massages, restaurant reservations, etc. 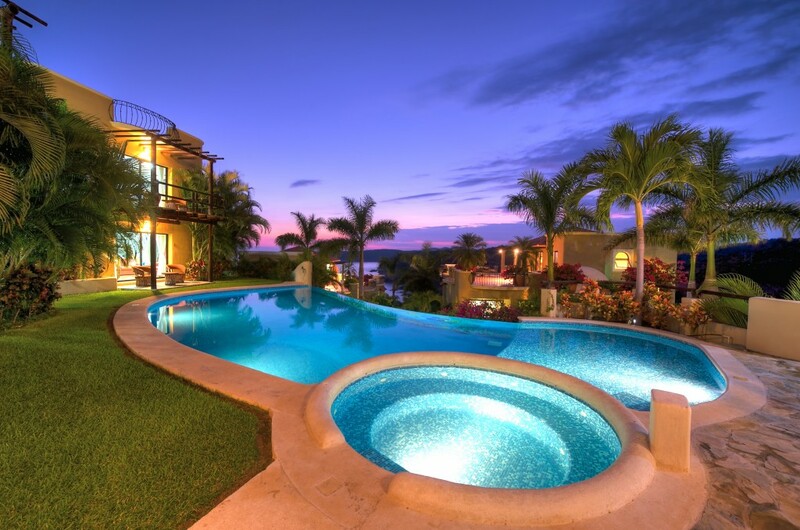 All three of the villas are gigantic and everything is wide open. Each has four suites, making them ideal for both couples and families. Daily housekeeping service and a grounds keeper ensure you feel completely spoiled. There is also the option of having your meals prepared daily – TAKE IT! DO IT! There are few things more decadent than waking up and having fresh squeezed orange juice, coffee and fruit waiting for you on your poolside terrace. Follow that with a ridiculously delicious traditional Mexican breakfast and every day is off to a superb start. There are countless options for things to do and see if you’re feeling ambitious, but I can promise you’ll be hard pressed to leave the glorious sanctuary of your own pool over the Pacific. To enjoy the beach on Violin Bay, it’s a short, and not particularly steep, hike down to the usually deserted shore. The snorkeling is great and you’ll feel as though you have the ocean all to yourself. There is another fantastic swimming and snorkeling beach, La Entrega, that is also an easy walk from the property. There are a number of little restaurants there so bring some pesos. Avid snorkelers can also take a bay tour that brings you into some remote beaches by boat. I’d like to tell you we ventured out and explored more, but we are saving that for our return trip. This trip was dedicated to pure relaxation and soul rejuvenation. It was also about sleeping in, taking an hour and half to eat breakfast, cruising to the Súper Che to pick up wine and other goodies, napping, swimming, reading and stuffing ourselves with fresh ceviche prepared for us daily by the incomparable Margarita (our angelic and splendid cook, housekeeper and professional happy person). They say a picture is worth a thousand words so I am quite sure after checking out some of these you’re already planning your trip here… and you should be! A quick shout out to a local restaurant we visited in Tangolunda: We did actually leave our private paradise to sample some local fare with Ron and Jackie. There are a lot of expats here and one of their favorite hangs is the exceptional Cafe Vienna. The colorful Austrian owners, Manfred and Helmut, serve an unusual and delectable fusion of Austrian and Thai cuisine. It was excellent food and service and the only time in my life I have eaten expertly prepared European schnitzel in Mexico! Trust me when I tell you I could ramble on and on about this place… and I most likely will in some following posts. Suffice to say, you’ll love it here. I promise. There are few times in life when reality meets your expectations. A visit to Huatulco and a stay at Las Palmas may very well be one of them. Fantastic. I have been there and it was the most incredible vacation I have ever had. Everything was amazing and not a detail was overlooked by Courtney. The beaches were secluded and beautiful. The ocean was warm, clear and very inviting. Excellent staff and wonderful food. A truly unique vacation spot. We are on our way back again because it was too good not to revisit. Awesome photos! And — it really does look this beautiful when you are there. Our fourth winter holiday at Las Palmas will be in 2014. Can’t wait! What about scuba diving in the area? Is it available? YES, the hotel can arrange dives all around the bays. Las Palmas is truly Heaven on Earth. The amazing, friendly staff is just as lovely as your spectacular photos! Huatulco & Las Palmas will be an annual special getaway for us indefinitely!